With rising electricity costs, many building managers are buying new fluorescent fixtures or retrofitting existing fixtures with efficient lamps and ballasts. Lighting efficacy (efficiency) is expressed in lumens of light per watt of electricity. Several fluorescent lamp-ballast systems are available, varying in efficacy from 54-to-98 lumens per watt. The older, less efficient lamps are 1.5 inches in diameter and are called T-12s. The more efficient one-inch-diameter lamps are called T-8s or T8 Fluorescent Lighting. 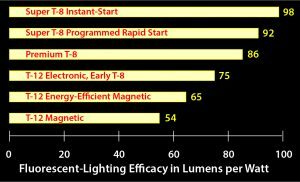 Besides being more efficient, T-8s lamps last longer, maintain their initial lumens longer, and render colors better than T-12s. You can save around a quarter of your lighting energy just by replacing your T-12 lamps with T-8s; T-8 lamps fit in the same fixtures as T-12s. However, it’s much better to replace lamps and ballasts or whole fixtures for up to 45% electricity savings and improved reliability. If the lamp and ballast aren’t matched appropriately, reduced lamp life, end darkening, and other problems may haunt the simple replacement of T-12 lamps with T-8 lamps. Your best electricity-saving option is to replace an existing T-12 system with the best current system of lamp and ballast, known as High-Performance T-8. Ordering a High-Performance T-8 system saves you from considering the many fluorescent-lighting systems, which have evolved over the past 25 years and are still available. To minimize electricity costs and optimize light levels, adjust your facility’s light levels to the needs of each area. A light meter can tell you whether areas are currently over-illuminated, under-illuminated, or correctly lit. Adjust the lumen output of the new lamps, based on existing lumen output and your area light-levels, by selecting ballasts with the correct ballast factor. For example, if you only need 2400 lumens from each lamp, select ballasts with a 0.80 ballast factor to drive a T-8 lamp rated at 3000 lumens (0.80 X 3000 = 2400). This fractional ballast factor reduces both illumination and electricity consumption by 20 percent, compared to a ballast factor of 1.0. If instead you want more than 3000 lumens from each lamp, specify a ballast factor greater than 1.0. High-Performance T-8 lamps, matched with instant-start ballasts, are the most common and reliable lamp-ballast combination. Replacing T-12 lamps and ballasts with High-Performance T-8s will give you a 20–40% annual return on your initial investment, depending on your electricity cost, number of fixtures, and current lighting efficacy. Purchase a High-Performance T-8 system through your nearest lighting wholesaler or electrical contractor.